Tonight, reps for Real Estate Equities Corporation (REEC) will appear before CB3's Landmarks Committee at 6:30 to discuss transferring the air rights from the landmarked — and under-renovation — Hamilton-Holly House across the street at 4 St. Mark's Place. With these air rights and approved zoning variance, the Morris Adjimi-designed building REEC planned for the northeast corner of St. Mark's Place and Third Avenue would rise to 10 stories — twice the size of the original plans. 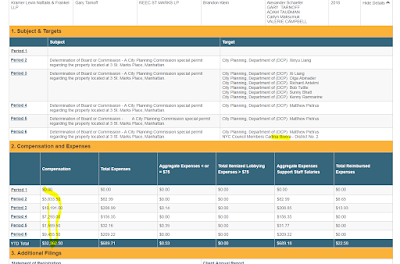 And as you sort through the various zoning documents (this link goes to the PDF on the CB3 website with details on the proposal) and public records for REEC, some familiar names emerge from behind the scenes. As public documents show, REEC has several lobbyists working on their behalf, including Capalino & Associates and Kramer Levin Naftalis & Frankel LLP. This past October, REEC filed plans for a 5-story, 29,030-square-foot building at 3 St. Mark's Place. A retainer agreement from Capalino to REEC on public record (PDF here) dated from last May 8 shows that there were already plans in place for a building larger than the current zoning allowed. The letter doesn't state dimensions for the building, only that: "Consultation will provide pre-certification and post-certification government relations expertise regarding the Uniform Land Use Review Procedure [ULURP]." REEC picked up the 99-year leasehold for the properties here for nearly $150 million in November 2017. The corner assemblage is owned by the Gabay family. The CB3 Landmarks Committee meeting tonight is at the JASA Green Residence, 200 E. Fifth St. at the Bowery. The parasites are at it again. And our mayor want to be president?!... As long as he's a "progressive" he's protected by the Times, News and "progressive" prosecutors. When I post on the Times about the his administration "circling the drain of corruption" they won't print the post. ONE PARTY RULE. ONE PARTY RULE. Yes yes yes THANKS Grieve for the follow through! Another Tech thing. Please tell me Carlina is not listening to Capalino again.